In a special year-in-review report, Opera Mediaworks,has selected the top 6 trends in mobile advertising witnessed on its mobile ad platform, the world’s largest, reaching 400 million consumers a month via 60 billion ad impressions. • We began to see the slow decline of the traditional banner ad. Though traditional banner ads still comprise more than half of all ads served on the Opera Mediaworks platform, rich-media units are on a dramatic upswing. More significantly than ad-volume share, rich-media ad units are expected to contribute to overall mobile ad revenue in the coming year. • Interactive voice ads made their market debut. Nuance Communications, the company behind the technology that powers Siri and Dragon Dictate, this year introduced a rich media ad unit that uses voice to interact with customers. Opera Mediaworks was the first to use the unit in the United States, with a campaign for the national airline JetBlue. More campaigns featuring the voice unit are running during the 2013 holiday season. • Advertisers struck a balance between targeting and user privacy. In the beginning of 2013, much of mobile targeting was done with contextual information, such as device and connection type. As the year progressed, more complex types of targeting became popular as marketers saw better conversion rates from privacy-friendly optimization methods including frequency capping and segmentation by OS version. • In the battle for mobile ad market share, Android wins. The iPhone was and still is the No. 1 driver of mobile-ad revenue on the ad platform, consistently outperforming Android by about 10 percentage points each quarter. However, Samsung had a breakthrough year in mobile sales and drove up the total number of Android devices worldwide. By late fall, it became clear that Android was the global leader in ad impressions. As a supplement to the report, Opera Mediaworks has released a timeline, Mobile Milestones of 2013. 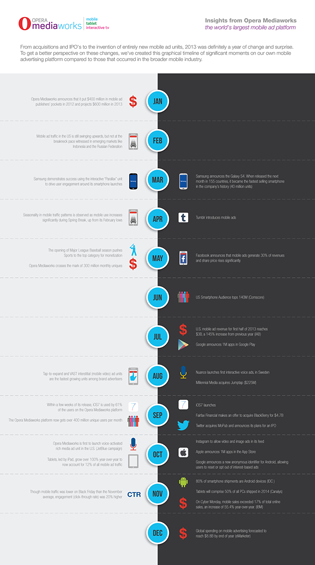 The timeline displays the most important moments in mobile that occurred during the year, from the Samsung Galaxy S4 launch in March and its corresponding mobile-ad campaign to the release of iOS 7 in September and its adoption by 6 in 10 of Apple mobile users within just a few weeks. To view the graphic and to read the full report, visit http://www.operamediaworks.com/insights/. Opera Mediaworks is the world’s largest mobile advertising platform, helping to power the global mobile economy. We improve efficiency, through technology, innovation, transparency and trust, to create an open and vibrant marketplace for publishers and advertisers across the globe. Opera Mediaworks includes AdMarvel, an ad-serving and mediation platform; Mobile Theory, a premium mobile ad network in the U.S.; 4th Screen Advertising Ltd., a premium ad network in the United Kingdom; and Mediaworks Performance, a results-driven mobile ad network. Also included are impressions served within Opera mobile properties, including the Opera Mini Smart Page and the Opera Mobile Store. Opera Mediaworks is part of the Opera Group.